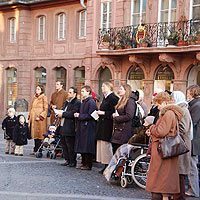 College students organize a Public Square Rosary in Mainz, Germany. Imagine one thousand or more rallies across America in public places. Faithful Catholics carry banners mentioning Our Lady of Fatima and her message. They gather together young and old to pray the rosary. They offer public witness to a message so often ignored. Approaching the 90th anniversary of the apparitions of Our Lady at Fatima, is it not time to look for supernatural solutions to our nation’s problems? Is it not time for the Fatima message to be proclaimed far and wide? 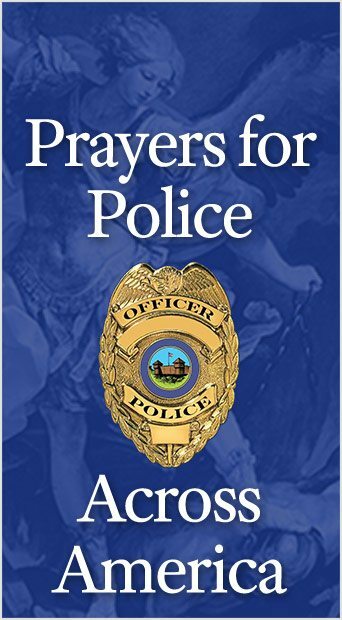 Is it not time for Americans to pray publicly for the future of the nation? After all, Fatima was directed to a huge public. Fatima’s Miracle of the Sun was one of the most extraordinary and spectacular public miracles in history. Our Lady appeared at Fatima in 1917 with a message not just for individual Catholics but for the world. She outlined the grave consequences in world events if men did not convert, pray, and do penance: Russia would spread its errors worldwide, causing wars and persecutions of the Church. Many would be martyred, the Holy Father would suffer, and a chastisement would annihilate several nations. So many of the evils foreseen by Our Lady are now taking place. And yet that which was meant to be shouted from the rooftops is rarely the topic of a Sunday sermon. How can Catholics bring the Fatima messages into the public eye? To commemorate the 90th anniversary of Fatima, America Needs Fatima will be promoting “public square” rosary rallies across the nation. The rallies are now starting and will culminate with a thousand or more such events on October 13, the 90th anniversary of the Miracle of the Sun. What does it take to become part of this massive effort? To organize a Public Square Rosary, all that is needed is a few friends, a Rosary, and confidence in the Blessed Mother. Any public square, busy intersection or community park will serve as a place. America Needs Fatima has set up a special center to assist you in all your needs. Caleb Petrone joins members of TFP Student Action for a Public Square Rosary at Gettysburg College. Groups are already being organized. Everyone is invited to participate. To find out more about organizing a Rosary group, click here. To see about joining an existing group, click here. On university campus, students are setting up Campus Rosary Crusade chapters in all 50 states (click here for details). Remember that by praying the Rosary, participants are using the most powerful spiritual weapon of contemporary history. With the Rosary, Saint Dominic defeated Albigensian heresy, Catholic forces were victorious against the Ottoman Turks at the battle of Lepanto in 1571, Communists were expelled from Vienna in the 1955, and many more miracles and victories were won. 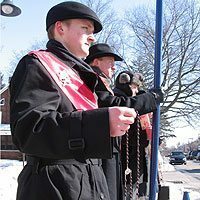 For more information on the Public Square Rosary Campaign, call 1-866-584-6012. This entry was posted in Public Square Rosary and tagged About the Public Square Rosary Campaign, public square rosary, Public Square Rosary Rally Crusade campaign by TFP.org. Bookmark the permalink.